When Twin Peaks: The Return arrived earlier this summer, it made me think of my mother. My mom loved Twin Peaks. She loved it so much that during its original, pre-DVR-era run, she recorded every episode on both of the VCRs in our home so she would have a backup copy of every hour. This never made much sense to me; had there been a fire at our house akin to, say, the fire at the Packard Sawmill, all of her copies of Twin Peaks would have burned to a VHS crisp. But my mother’s attitude toward this series defied logic, and she apparently had an obsession with having two of everything. So did Twin Peaks: The Return. The final two hours of The Return explore this theme repeatedly. (This is the part where I dutifully remind you that spoilers are ahead.) 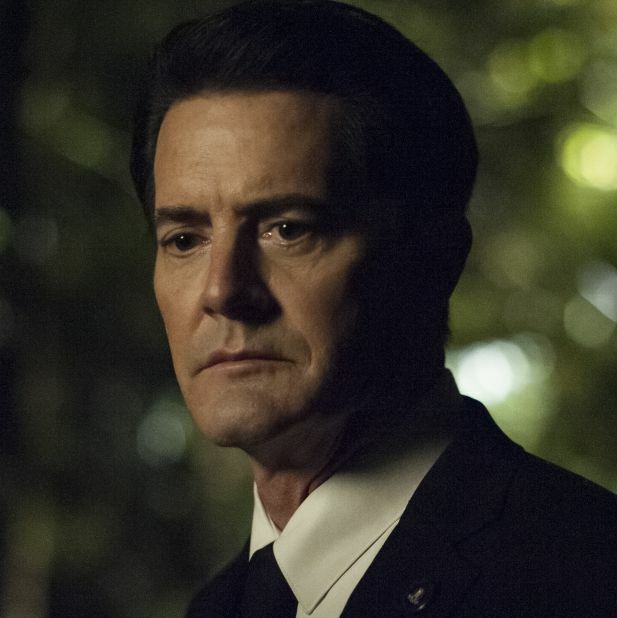 In episode 17, Mr. C, the dark version of Dale Cooper, arrives at the Twin Peaks Sheriff’s Department and tries to pass as the actual Dale Cooper while the real Agent Cooper is on his way there. Lucy and Andy initially assume Mr. C is the real, damn-fine-cup-of-coffee Dale, which is significant because the two of them, especially Lucy, seem to live in the past more blatantly than anyone else who works there. It isn’t until Lucy gets a call on her outdated, 1990-era telephone from actual Agent Cooper that she puts two and two together, runs into Sheriff Truman’s office, and puts a bullet into Mr. C. Shortly after she fires those crucial shots, she says, “Andy, I understand cellular phones now.” Her realization that a person could take two different paths, or exist on more than one plane, allows her to loosen her grip on an unwavering version of the past and finally comprehend the present. We then rewatch the first few moments of the Twin Peaks pilot, still saturated in color but tones that are more sepia than bright. This time, that body bag that famously washes up on shore has been erased and Pete Martell (the late Jack Nance) is apparently able to go fishing without discovering Laura’s dead body, wrapped in plastic. Twin Peaks, as you thought you have known it, didn’t happen that way at all, it seems. This is a beautiful “whoa” of a mind trick and another reminder that our notions of the past are slippery and changeable. But then Lynch and co-creator Mark Frost yank away that semi-hopeful version of events by having Coop lose his grip on Laura’s hand, then sending him on a journey in the final hour to track her down and bring her back to Twin Peaks. He eventually winds up in Odessa, Texas, where he finds Laura’s doppelgӓnger, Carrie Page (initials: C is for Cooper, P is for Palmer), a real Shelly Johnson type who is a waitress and apparently just murdered her boyfriend or husband and is therefore totally cool with taking a spontaneous road trip to Washington state with a G-man who insists she’s someone named Laura Palmer. Cooper seems to think that this trip will close some sort of loop or bring closure. As an audience expecting a happy ending even though we should damn well know better, we anticipate how wonderful it will be when Carrie sees Sarah Palmer, realizes that she’s actually Laura, and is able to embrace her mother again. But of course, that’s not what happens. Cooper and Carrie knock on the door of the Palmer residence and are greeted by a woman named Alice Tremond, who says she bought the house from a woman named Mrs. Chalmont, names both previously attributed to a character of significance in the Twin Peaks canon. Confused afterward, Cooper stands in the street and asks, “What year is this?” at which point Carrie hears the faint sound of a voice calling for Laura. In an instant, she seems to remember everything, letting loose a primal scream. This ending completely sidesteps any attempt at tying things up neatly. In fact, so many threads are left dangling at the end of Twin Peaks: The Return — please, don’t get me started on Audrey — that it’s barely a sewn-together garment in the traditional sense. Yet somehow, that doesn’t prevent the finale and so much of this limited series from affecting the viewer on a primal level. More than any other show that I can think of, Twin Peaks speaks to our subconscious, in places that shall not be named mainly because we don’t know how to even name them. Sure, for those who think TV and film critics are far too willing to give David Lynch a pass for lazy, self-indulgent storytelling, that may sound like a cop-out. But I also think it’s true. As wayyy out there as Twin Peaks can get — and it zoomed even farther beyond the outer limits than I thought it would this season — watching it can still be remarkably personal. It felt that way to me on Sunday night, as this meandering quest ultimately concluded with a woman almost reuniting with her mother but missing that chance because of the way things shifted in space and time. My mother took the show very personally, too, because she often saw connections to her own life in the details of Twin Peaks, either through films she loved that the show referenced (“Waldo the myna bird has the same name as the killer in the movie Laura,” she must have reminded me about 50 times) or people she loved (Major Briggs has the same first name, Garland, as my mom’s father). These connections, coincidental or not, heighten the sense that Lynch and Frost not only understand how your dreams work, they’ve been spying on the synapses in your brain. In Sunday’s finale, Cooper reads a letter from Diane that refers to him as Richard, something that was hinted at all the way back in episode one of The Return. In the letter, Diane calls herself Linda. Linda was my mother’s name. Again, a coincidence. But also a detail that stabs at the heart. Frequently, Twin Peaks: The Return seemed to commune with the dead and resurrect the souls of those who seemed lost. Not only did we essentially watch Log Lady Catherine Coulson in the last moments of her life, both real and fictional, we saw so many late Twin Peaks greats — the aforementioned Jack Nance, Miguel Ferrer, David Bowie, Don S. Davis, and Frank Silva as the still-terrifying original BOB — alive again before our very eyes and identified in the credits as if they had never left us. In the end, the show even resurrected Laura Palmer, though not in a familiar form, and in a way that refused to give this abused victim her life back. That may be cruel. But it’s also what a reboot as stubbornly radical as Twin Peaks was built to do. This Return brought back the gum you liked. But it did so with vastly different, disturbing, and unforgettable style.